Many of the largest man-made structures were made in part by ironworkers, including bridges and skyscrapers. In 2010, there were approximately 59,800 iron or steel worker jobs in the U.S., 85% of which were in the construction industry. These hard working individuals have physically demanding jobs that are also at a high-risk for injury or even death. Cutting steel. Ironworkers weld, cut and bend steel for the structures they help build. Position beams and girders. Ironworkers align and position the beams, girders and columns as they are being hoisted into place. This can involve standing high up on a structure, guiding the iron or steel piece into place. Connections. Workers will use bolts and welding to connect the iron and steel structures and hold them in position. Crane operation. Large cranes are often used to lift these heavy beams. 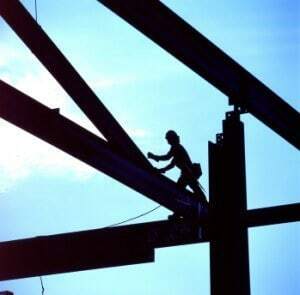 Ironworkers may be operating the cranes or signaling to the crane operators to direct the positioning of the iron or steel structures. If you or a family member was injured while working as an ironworker, you are likely entitled to workers compensation benefits. Contact the workers compensation attorneys at Rosenfeld Injury Lawyers LLC for more information and a free review of your legal rights and options. There are many dangers to contend with for ironworkers. Heavy lifting, welding hazards and fall risks are just a few of the possible causes of injuries that ironworkers face. The occupation is one of the highest risk jobs for both fatal and non-fatal injuries and illnesses, ranking consistently in the top 10 in several injury areas. In 2008, ironworkers ranked as the fourth most dangerous job in the U.S. with a fatality rate of 46.9 deaths per 100,000 full-time workers. Falls. Ironworkers are 10 times more likely to incur a fall related death on the job then any other construction job. Often workers are balancing on beams only a few inches wide, several stories or more above the ground. Cancer risk. In a NIOSH study on 13,000 ironworkers over a seven-year period, the study group had much higher instances of lung cancer and mesothelioma then the rest of the U.S. population. Welding hazards. Ironworkers are ranked in third in jobs that have exposure to harmful fumes and radiation associated with welding. Exertion injuries. Due to the heavy materials and equipment ironworkers’ handle, they are at high risk for back injuries and musculoskeletal disorders, such as ruptured discs, tendonitis and carpal tunnel syndrome. Non-fatal injuries. Ironworkers rank 3rd overall in non-fatal work injuries with 392.7 injuries per 10,000 workers per year. The average in 2008 for all industries was 113 per 10,000 workers.